La Mesa Wine Works – When All Else Fails, Wine Works! WHEN ALL ELSE FAILS, WINE WORKS! 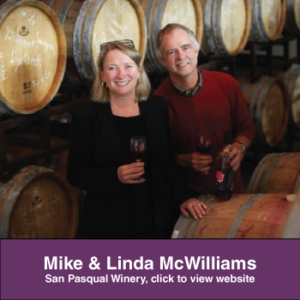 La Mesa Wine Works is a cooperative tasting room and urban winery venue hosting two local wineries – Wyatt Oaks and San Pasqual Winery. Located in La Mesa’s vibrant industrial area, we are open to the public Wednesday through Sunday. As one of the fastest growing wine regions, San Diego County has a lot of great wines to offer. Thus the idea of a co-op tasting room began. We decided it was time to offer a larger space to meet the needs of San Diego wine connoisseurs. 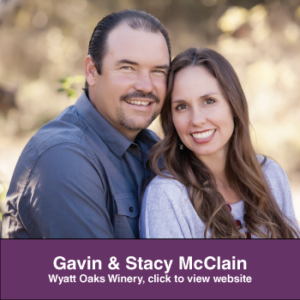 All of the wines that we serve at La Mesa Wine Works are produced locally by our winemakers Linda McWilliams (San Pasqual Winery) and Gavin McClain (Wyatt Oaks Winery). Our wines are frequent award winners at local, national, and even international wine competitions. Our extensive wine list typically includes six to eight different wines from each winery, ensuring there will be something to please every palate. 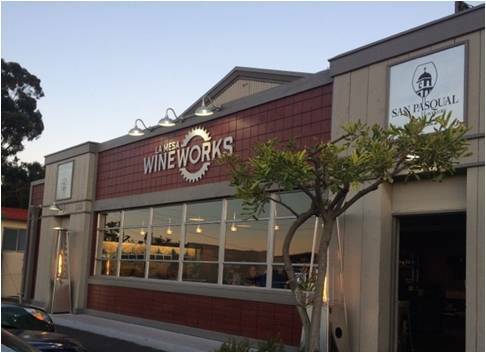 Wine Works is located in the industrial area of La Mesa. The building that Wine Works occupies was previously a sign manufacturing facility and before that was home to a variety of light industrial businesses, including La Mesa Floor and Tile and La Mesa Blueprint. Many of the industrial features, such as the overhead gantry trolley are still in place. We are located between Bolt Brewery and Helix Brewing Co.